← Lloyd Strayhorn’s 2012 Predictions!! “LIVE YOUR DREAMS’ Celebrate Dr. Martin Luther King, Jr. I just finished listening to the speech that Dr. Martin Luther King, Jr. made the night before he was assassinated. It made me break down and cry. So powerful and filled with so much emotion. He knew at that time he was going to die; very deep. He did not run, cower, complain or mumble, he did what GOD put him here to do; that was to make positive change. And he did just that. His spirit continues to live on and push us to do what is right. I wonder what Dr. King would do in this time? I remember he said in his speech, “Darkness cannot put out darkness, only light can put out darkness”. That is so true. I look at what is going on in Washington and I see the dark ages trying to slip itself back in, I see people who swore to uphold the Constitution of the United States, now trampling it under their feet. Greed has poisoned most of our politicians and racism is running rampant. I think if Dr. King were here now, he would be marching once again. Dr. King’s Dream was much more than race, it was about equality for all people. He stated in his speech about the need for restructuring the whole of American Society. He saw the inequality of wages, wealth and opportunities much like what the Occupy people are speaking of. It’s just that People of Color have been going through this much longer than they have, it unfortunately has become a way of life for too many Black folks and now Latinos. Dr. King said that we must end the “Economic Racism’ that exists here in America. That in itself is very profound as that is at the heart of many problems; unequal economics and the lack of real opportunities for People of Color and now other races. We must take what Dr. King spoke of when he said, ‘I Have A Dream’, and make it our own. Do not give up and do not give in to negativity. Despite all of the horrors that he faced while marching for what was right, he still saw the goodness in humanity and saw that ‘We Will Overcome’ someday. The only way we can overcome is to Live Our Dreams. Be the best that you can be personally, that will in turn help you and all people and situations in your life. It is easier said than done but it must be done for humanity to evolve to the next level. We must make this world a better place for our children and to give ourselves the opportunity to be happy, healthy, wealthy and loved. That may mean taking a risk that you never thought of before. Taking a risk on You! Fear is like a vampire as it takes away our desire to BE WHO GOD MEANT US TO BE! Conquer your fears by thinking this:’ What always is, will be and what is not, never will be!! So don’t worry about what may or may not happen, just do it!! Celebrate yourself, respect your elders and learn from them as they have traveled a path you have yet to take. Lastly, let’s celebrate Dr. King’s Birthday!! 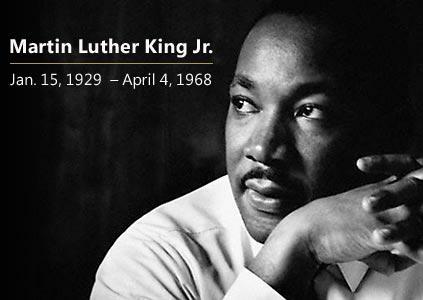 May his legacy live on forever and thanks to all of the people who helped to make his birthday a national holiday and thanks to all of the people, Black and White, who marched with Dr. King! You stood up and helped America be a better place when it was very dark. Now the work must continue as some of us have forgotten and want to turn the clock back!! That must not happen, we must move forward!! Stand up for what is right and good!! This entry was posted in Martin Luther Kings Birthday and tagged African American History, Black History, Black History and Culture, Civil Rights, Civil Rights Act, Dr. Martin Luther Kings Birthday, I Have A Dream. Bookmark the permalink.